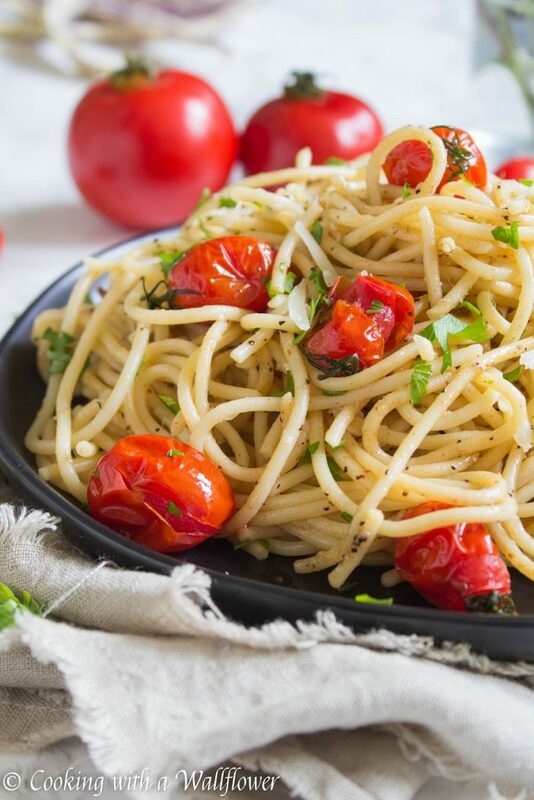 Buttery parmesan and black pepper pasta tossed with burst tomatoes. 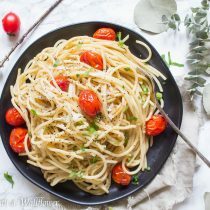 This classic cacio e pepe with burst tomatoes is delicious, simple to make, and perfect for a weeknight dinner. The first few days of October have gone by so fast. And as the days get shorter and the sun sets sooner, I’ve been looking forward to simple meals at night. Ones that don’t require much prepping. Ones that need just a few simple ingredients. Ones that don’t require me to run to the grocery store. 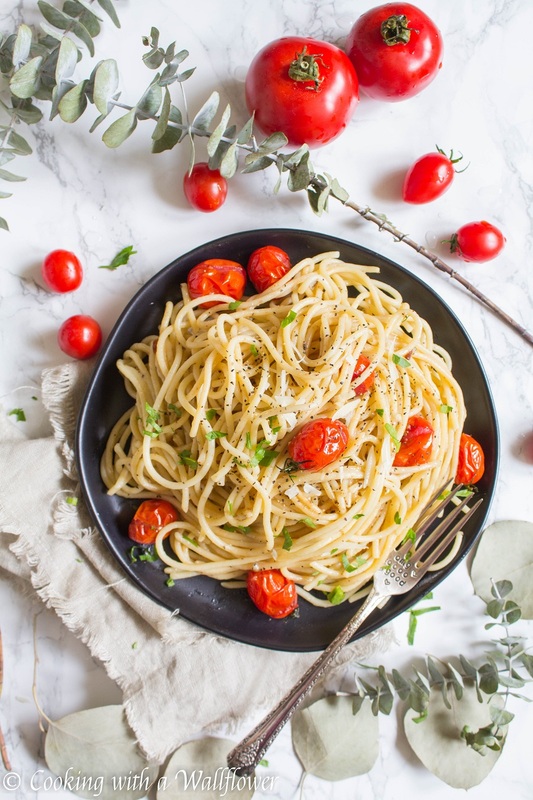 This cacio e pepe with burst tomatoes is as simple as it gets. I have a few staples at home. For those nights when I want to quickly whip something together. Butter is a must. Salted butter for bagels. Unsalted butter for baking. 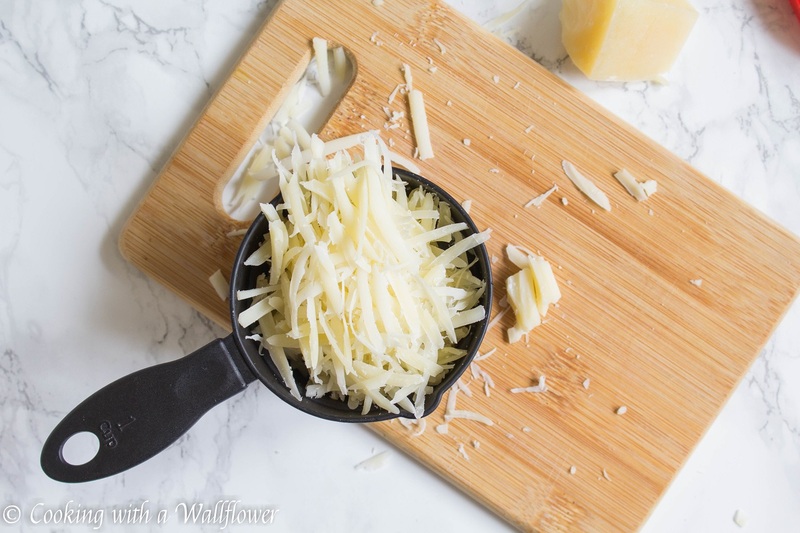 Parmesan and cheddar cheese are also staples. And our house is never without any kind of pasta. 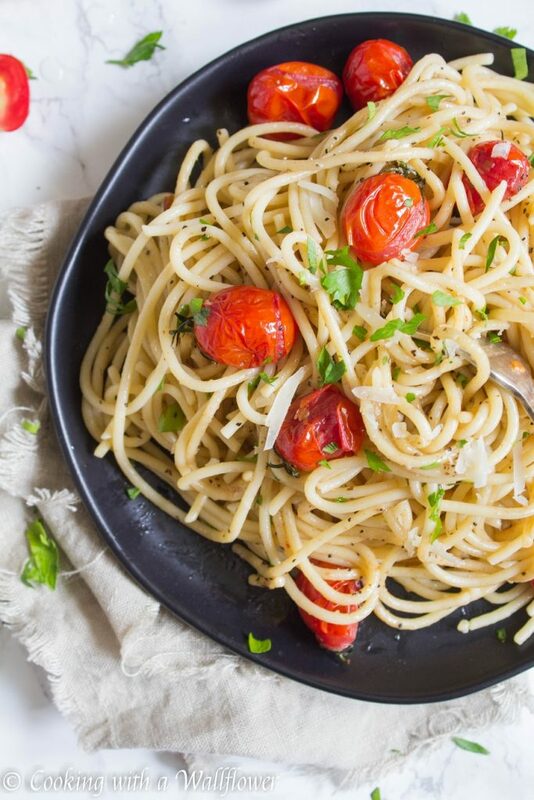 Seriously, there are usually at least three types of pasta sitting in the pantry. 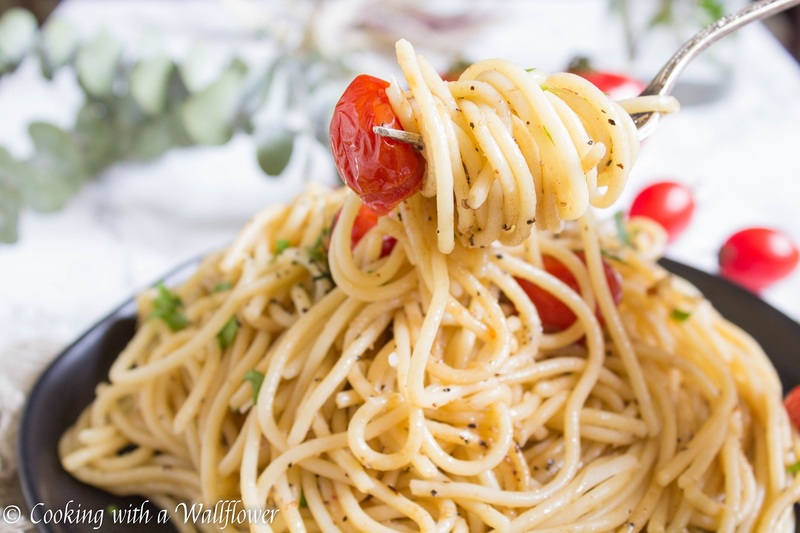 What I love most about cacio e pepe is that it requires very little ingredients. Ingredients that you most likely have at home. Salted butter, pasta, black pepper, and parmesan. To give it a little twist, I added fresh tomatoes. You can use whatever tomatoes you like, but I used cherry tomatoes. And to give it a pop of color, I garnished the pasta with finely chopped parsley. But it’s completely optional. Let’s make this pasta together. And savor the simplicity of a home cooked meal. Aka pasta night. Bring a large pot of salted water to a boil and cook the pasta according to the directions on the box until al dente. Before draining the water, reserve about 1 cup of pasta water. Then drain the pasta. 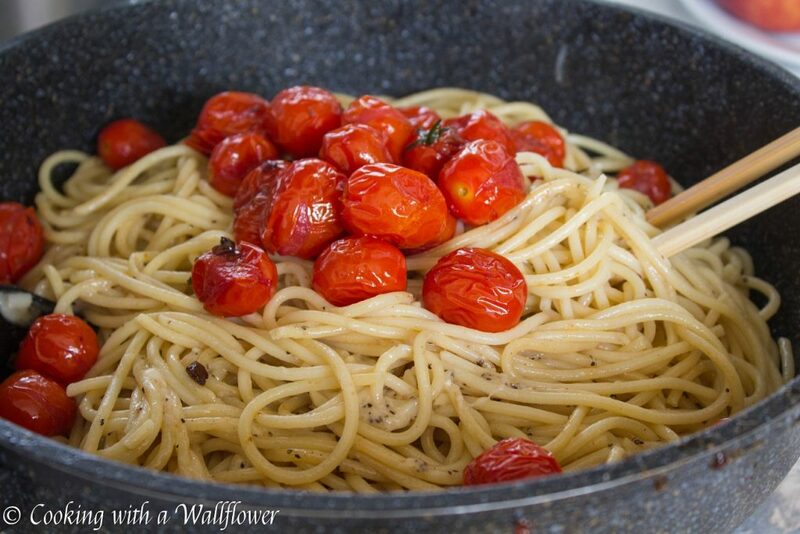 Set the pasta aside for now. In a large skillet, heat about a tablespoon of olive oil for about a minute. 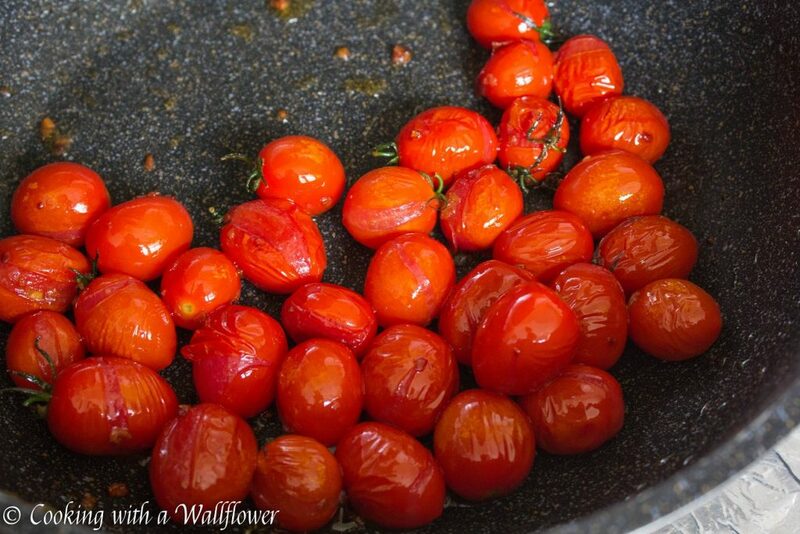 Add cherry tomatoes to the skillet, and cook for a few minutes until the tomatoes have burst open. Set the tomatoes aside for now. Melt 2 tablespoons of the salted butter in the same skillet over medium heat. Add black pepper and cook for about a minute until toasted. Now add 3/4 of the reserved pasta water and bring to a simmer over medium heat. Add the pasta and the rest of the salted butter. Lower the heat then add parmesan cheese and toss until the parmesan has melted. Remove from heat, add the burst tomatoes, and toss until combined. Add more pasta water if needed to thin out the sauce. Divide the pasta onto plates. 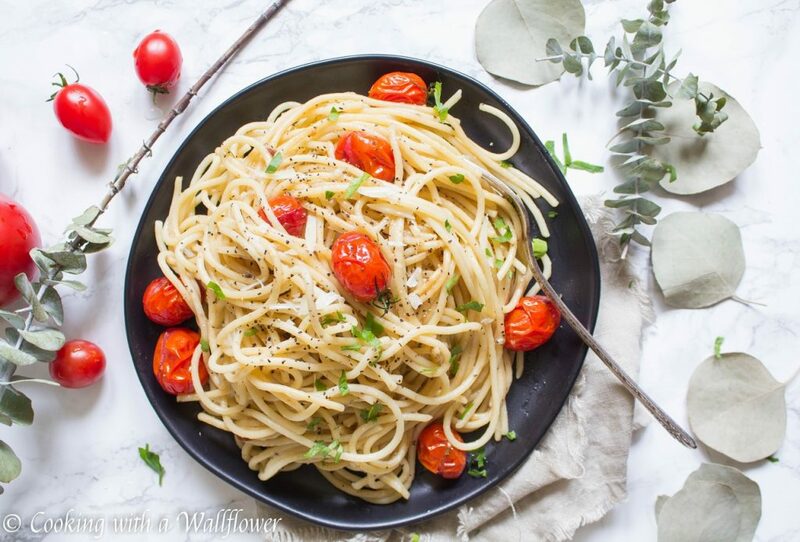 Garnish the cacio e pepe with burst tomatoes with finely chopped parsley before serving. Now add ¾ of the reserved pasta water and bring to a simmer over medium heat. Add the pasta and the rest of the salted butter. 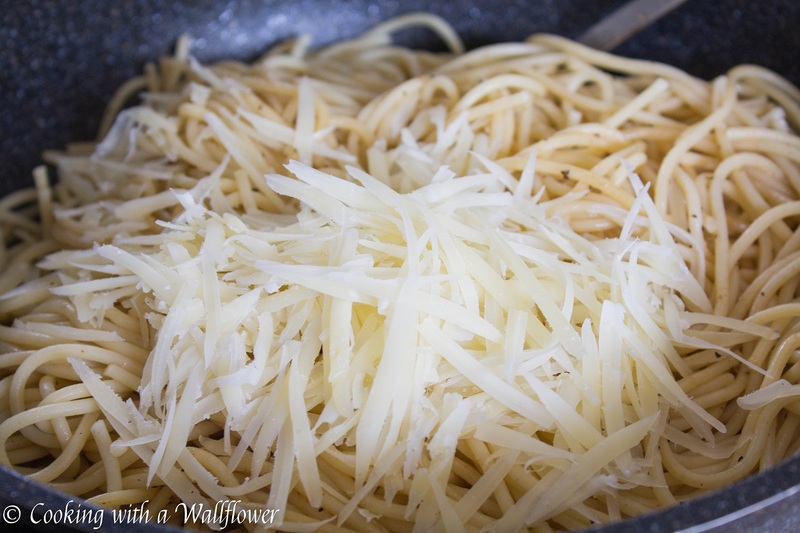 Lower the heat then add parmesan cheese and toss until the parmesan has melted. 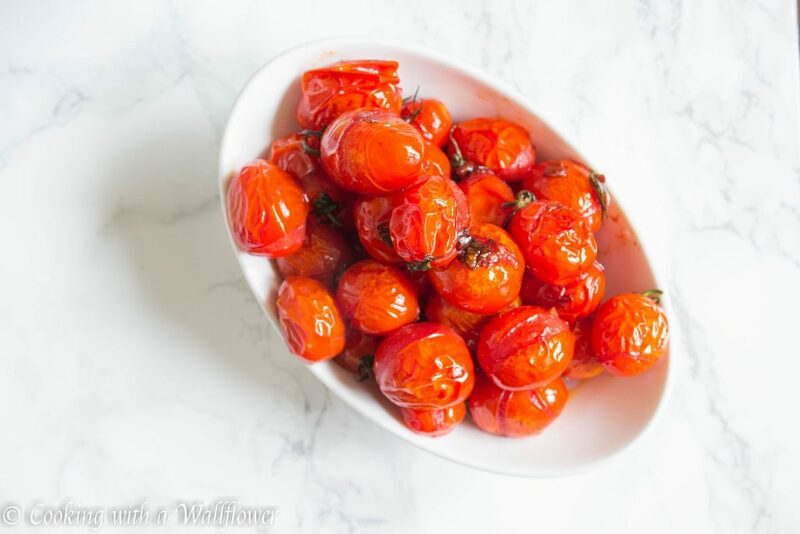 Remove from heat, add the burst tomatoes, and toss until combined. Add more pasta water if needed to thin out the sauce. 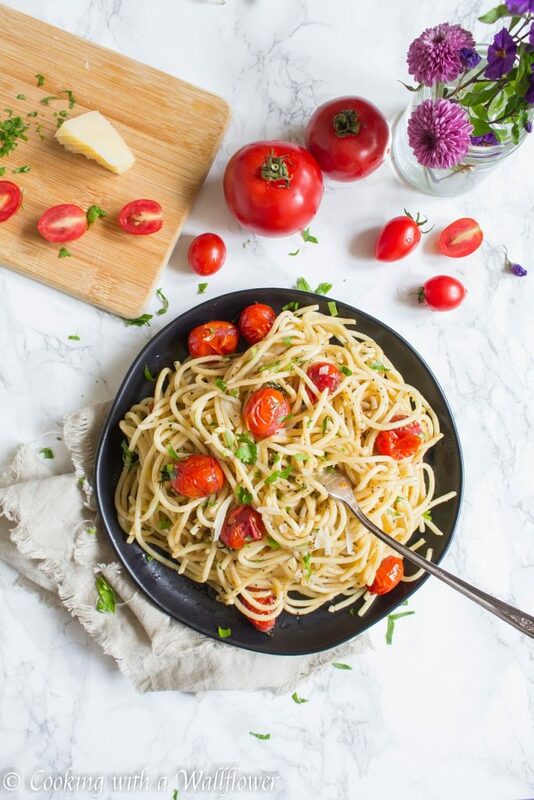 This entry was posted in Entree, Farmer's Market, Healthy, Italian Inspired, Pasta, Quick and Easy, Recipes, Summer Cravings, Vegetarian and tagged cacio e pepe, Pasta, quick and easy, weeknight dinner. Love the simple ingredients in your recipe! Looks great, and I imagine it tastes the same. Can’t wait to try it out! 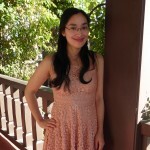 Love how simple and quick this can be! Beautiful photos but not for my wife and I as the we are diabetic and the carb count is out of sight. Enjoy it while you can young ones. Keep up the good work.